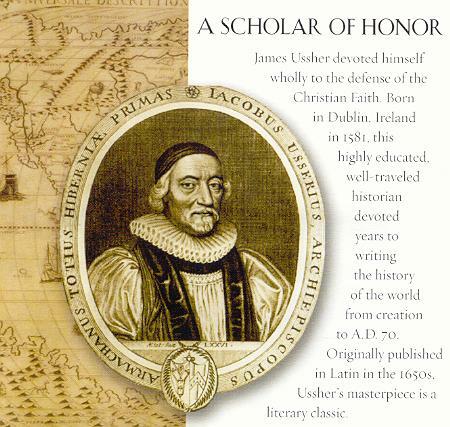 After a lifetime of research, James Ussher set out to write a history of the world from creation to A.D. 70. The result was published in the 1650s as the literary classic The Annals of the World. Using the Bible as his main source, Ussher began with the death Nebuchadnezzar as a reliable date and worked backward through the genealogies of the Old Testament to arrive at the date of creation -- 4004 B.C. Integrating biblical history (around 15% of the text is from the Bible) with secular. Ussher wrote this masterpiece. 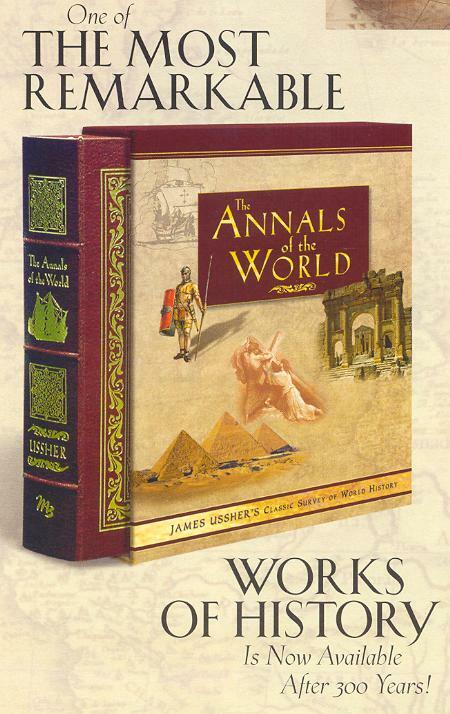 As a historical work, Ussher’s The Annals of the World is a must have for libraries of all sizes. Churches, universities, public and private schools, pastors, professors, students, and families will find a treasure-trove of material previously unavailable. Containing many human interest stories from the original historical documents collected by James Ussher, this is more than just a history book -- it’s a work of history. Popularly discarded when evolutionary-based theories became "vogue" in the last half-century, Archbishop James Ussher was a well-respected and important historical scholar of ancient history during the early 17th century. 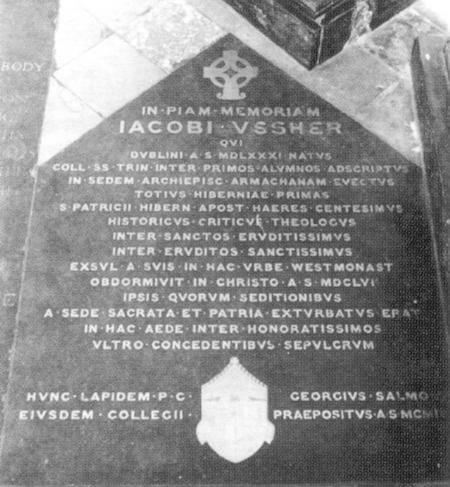 A meticulous researcher and compiler, Archbishop Ussher is credited with correlating the date of the earth’s creation, through a meticulous chronology of human history. His chronology of dates was included in authorized versions of the Bible from the early 1700s until very recently. In fact, few Bible publishers include Ussher’s dates, frankly due to the ground rules set for the age of the earth via evolutionary sources. A highly respected scholar and theologian, still widely studied today, he used the book of Genesis, and then a collection of historical documents and manuscripts, many lost to time or no longer available for study, for the unparalleled academic work known as The Annals of the World. 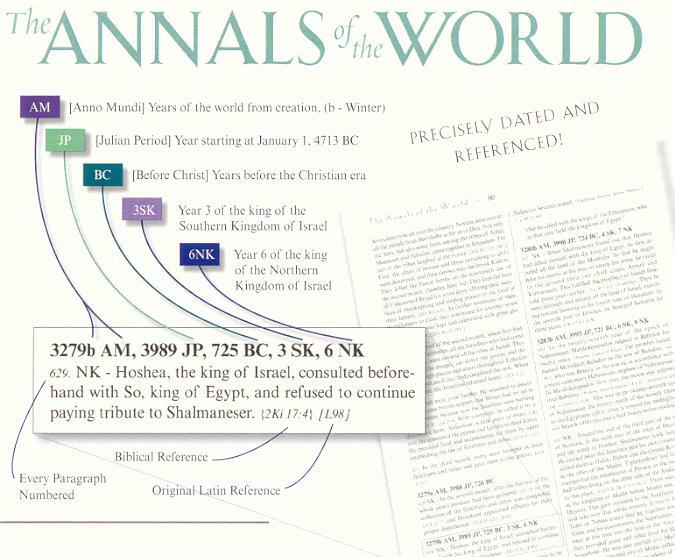 Considered not only a literary classic, but also an accurate reference, The Annals of the World was so highly regarded for its preciseness that the timeline from it was included in the margins of many King James Version Bibles. Throughout the 18th, 19th, and 20th centuries, calling to mind the fact that the earth is only around 6,000 years old. As evolutionary philosophies, especially the long ages for the earth, took root in the 20th century, Ussher’s sound scholarship faded from Bibles. But now it’s available for you! Price varies according to sellers.